Heat grill. With narrow sharp knife, make a 1-inch slit in one side of each steak. Make a pocket in each steak by moving knife around inside of steak. DO NOT ENLARGE THE 1-INCH OPENING. Spoon half of pesto into each steak, spreading it around the inside of the steak. Brush all sides of steaks with oil; sprinkle with salt and pepper. When ready to grill, place steaks on gas grill over medium heat or on charcoal grill 4 to 6 inches from medium coals. Cook 7 to 11 minutes or until of desired doneness, turning once. 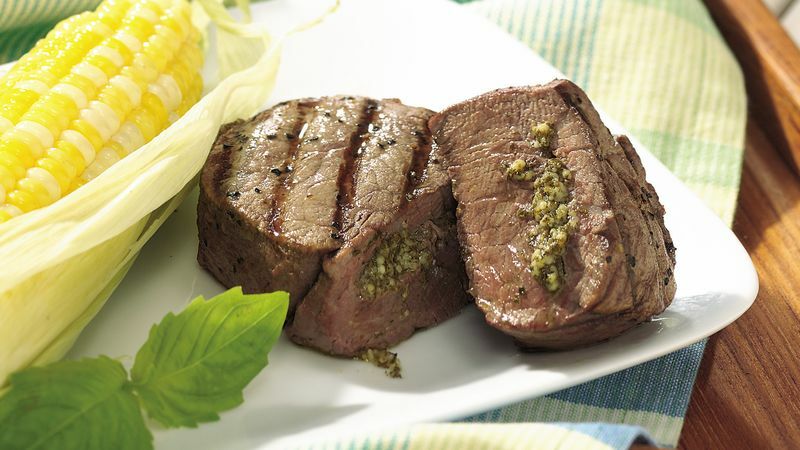 To broil steaks, place on broiler pan; broil 4 to 6 inches from heat using times above as a guide, turning once.